I want the tastiest mayo at the right price. New HELLMANN'S Deli Mayo delivers sweet, tangy and Deliciously affordable sandwiches. 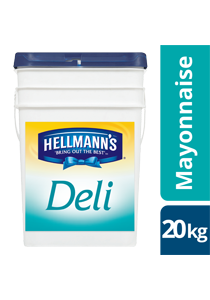 The new HELLMANN’S Deli Mayo – developed specifically for those who needs to deliver the best tasting sandwiches at the best possible price. And because it from HELLMANN’S – the World’s #1 Mayonnaise – we guarantee it's good. We're so confident that you'll love the sweet & tangy taste and its rich & creamy texture, we are offering a "Money back guarantee". It can be used for sandwiches, wraps, burgers, salads, potato salads, coleslaw, dipping base for sauces. Weight - 20kg. Weight per serving/portion - 20g. Made by HELLMANN'S, the New HELLMANN'S Deli Mayo delivers a consistent sweet and tangy taste, especially made to enhance the taste experience of sandwiches in an affordable price. Rich and creamy texture that keeps bread fresher for longer. Ideal for spreading as it spreads evenly and easily, and keeps the bread from getting soggy.